What about Desalination during the Drought? When discussing the current drought in California, there is often talk of desalination and its potential to increase our freshwater supply. 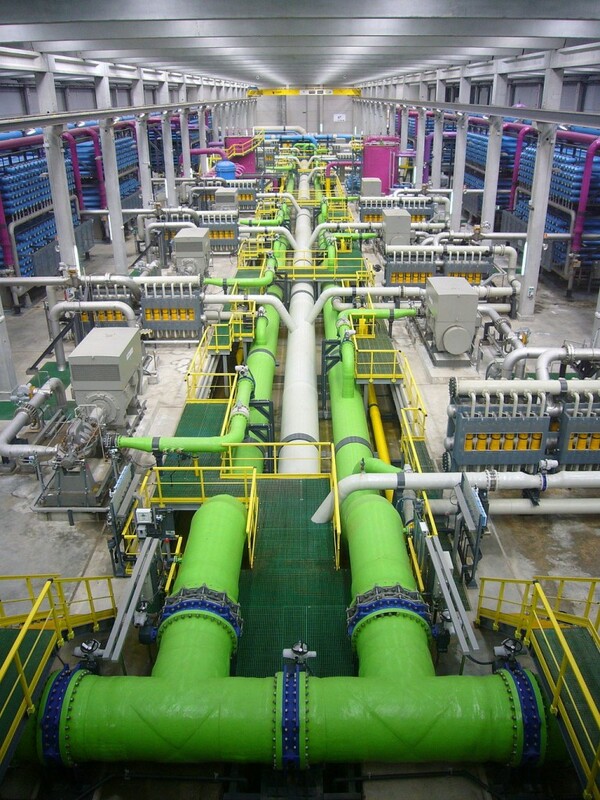 Desalination, the process of removing salt and minerals from saline water, seems like an obvious solution to the drought and ongoing water scarcity concerns because it is a reliable, drought-proof water source. Indeed, fourteen new desalination plants have been proposed along the California coast and one is under development in Carlsbad. For many, this may seem like an answer to the “exceptional drought”. As consumers, it may also seem like a way to help us avoid making lifestyle changes, such as Governor Jerry Brown’s call for Californians to reduce their water use by 20 percent. But while desalination may be a reliable option, the answer is much more complicated. One of the greatest issues with desalination is the cost associated with these projects. A new plant may cost upwards of hundreds of millions of dollars to build (a billion in the case of the Carlsbad facility), plus considerable cost to run the plant. Beyond the costs to build these facilities, operational costs are substantial and raise concerns over the energy requirements and their impacts. Energy costs make up arounda third of total operating costs for a typical desalination plant. In California, there is concern about vulnerability to short-term and long-term energy price increases. During a drought, energy prices tend to increase due to the reduced ability to generate hydropower and the need to replace that hydropower with more expensive energy sources. These costs are often overlooked and not always factored into the total project cost. Long term, energy prices are not static and may increase due to the rising costs of developing renewable alternatives and building and maintaining new and existing infrastructure. With these high capital and operational costs also comes a higher cost of its product, water. Desalinated water can cost upwards of $1,900 per acre foot, considerably more than other alternatives such as water conservation and efficiency, stormwater capture, and recycled water. Aside from the costs, there are other potential externalities associated with desalination facilities, including environmental impacts. Seawater intake systems that draw ocean water in through screened pipes impinge marine organisms on the intakes. Smaller organisms able to pass through, such as eggs, larvae, and plankton, are entrained into the plant and killed during the desalination process. Produced water disposal can also have a substantial threat to marine life. The salt is concentrated into a brine that is usually pumped back out to sea for disposal after going through the desalination process. These point sources increase salinity levels and may affect local sea life, depending on the plant’s location and sea currents. The idea of building seawater desalination plants during a drought is not a new one. In 1991, a desalination plant in Santa Barbara was constructed in response to the 1987-1992 drought. Once the plant was completed, abundant rainfall rendered the plant cost-inefficient, and it shut down in 1992. Currently, costs to restart the plant are being assessed as the technology and infrastructure are dated and would incur new capital investment. Likewise, six seawater desalination plants were built in Australia in response to the Millennium Drought. Today, four out of the six plants are left idle due to the availability of cheaper alternatives. These examples should serve as cautionary tales. The good news is that we still have cost-effective options readily available. A new study by the Pacific Institute and NRDC shows how California’s drought can be managed with better allocation and management of water resources. By implementing water-saving practices, water reuse, and stormwater capture, California can save 5.2 to 7.1 million acre-feet of water each year in our urban areas – equivalent to the output of 125 large desalination plants! Sustainable water management is best served by creating a comprehensive water management strategy in California, one that captures the most cost-effective options first. California has the ability to bridge the gap between water demand and supply by taking advantage of the existing resources and practices that have yet to be fully and efficiently harnessed. I’m not an engineer or a scientist, but I am an inventor. The answer to California’s water problems seems self evident to me. I just don’t understand why desalinization has to be so expensive? California is a coastal state. Why not build domes next to the ocean, use solar power to heat water in large concrete holding tanks/pools under the domes, use the natural motion of waves and tides to circulate water through these tanks or pools (and also through cooling “radiators” above the tanks/pools and create fresh water through mimicking the natural process of evaporation, clouds and rain to collect the water that would run down the interior of the domes and also be collected under the cooling “radiators”? Yes, I know there would be a brine build up at the bottom of these holding pools, but that could simply be removed with strainers, or even manually by shovel every few days (or more if needed) by minimum wage workers. I have drawn up plans for a system like this and it really wouldn’t cost the state much at all. The excess brine would be hauled inland to places similar to landfills and any portion of it that could be used for other purposes (industrial or for consumption) would simply be given away. There would be no damage to marine life as the water intake from the sea would be protected by a wire or fabric mesh and the excess salt would not be returned the the sea. It’s such an obvious solution! Hasn’t anyone thought of this? If anyone in California government or even a private benefactor seeking an easy and hugely helpful investment would like to talk about this or would want me to build a test prototype to show what an easy solution this could be for California, please feel free to contact me. I have discussed this idea with a number of biologists and construction engineers and haven’t gotten one negative response. I have family in California and have been reading about the drought for years and haven’t seen one legitimate plan for the future for solving this issue. Drilling further down into the aquifers is much too expensive and will only be a temporary fix. The reservoirs are close to dry. Shipping in water and putting tanks in peoples front yards is a band-aid, not a solution. Something must be done! I’ve read of one man using salty run-off from field irrigation in California, but that source of water is also finite (but a great idea!) The current process for desalinization of sea water is far too over complicated, over thought, and incredibly expensive. For what it’s worth, there’s my two cents and my idea. I see pictures of all these lakes and resistors at record.low levels. Howe come they don’t dig out the dry soil making the lakes deeper so when we do get more rain they will have more capacity? I agree with Mike Pratt. Get busy and build desalinization systems that employ solar power to evaporate sea water and figure out how to condense all that water vapor to pure water. California has all the essentials: sea water, sun, and high mountains. An extension on Mike’s idea: use a desert dry lake to evaporate the sea water. Move the humid air/water vapor up a nearby desert peak with a huge tube. At the mountain top, the cooler air condenses the vapor in the tube. The condensation releases the latent heat of vaporization, creating hot air that rises and escapes through vent ports at the very top of the tube. Very little power is now required to force moisture laden air up the tube. California has a tiny but permanent rain shower. It makes no sense that desalination would cost so much unless you let the state manage the project. The government on all levels waste money. Privatize the darn project, quit spending money that keeps folks dependent on the government, and divert funds from the awful bellet train project and actually do something that will help all California citizens. If you need help, I know a third grader you can talk to.
. I believe in the desalination processes, and the building of Desalination Plants in coastal cities of California. I knew that Dubai used the desalination process for portable water and making snow ski resorts in Dubai. However, I also found an article from an Israeli Desalination Company that was in Los Angeles promoting water desalinization and explained just how well it works for the farms and the big cities dwellers in Israel.. We could come up with excuses that Dubai is a very rich country. They can afford to do it. Dubai is an oil producing country. However, Israel is not an oil producing nation and they can afford the processing plants. California is not a poor state. We have a high concentration of the best scientists in the world living in California. Our scientist can figure out the most economical way to desalinate the ocean water and make it portable water. This method doesn’t mean that once the process is mastered, we can waste water. Desalination is a proven method of getting salt water to portable water. It is a workable solution to have water during draught problem. Why not utilize an existing offshore oil platform. Install RO gear or evap gear and use existing natgas supplie to power turbine electric generation for system. Also use wind and wave energy. A mobile barge system could also be built for rent to municipalities up and down the coast. I live overlooking Lake Mead. It is down 140 feet now. Why could we not run a water pipeline down from British Columbia, and dump it in Lake Mead at the Overton Arm ? Has Jerry Brown in his excessive dreaming, ever consider such a project ? The pipeline would be relatively simple to build, running through the Great Basin areas of Washington, Oregon, and Nevada. In the main, mountain ranges tend to run North and South in those areas. If Canada wouldn’t sell water to us, maybe the Columbia could be tapped in Washington. Has anybody ever thought about this ?.